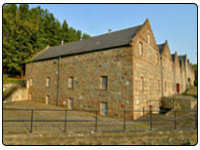 Dailuaine Distillery was built in 1852 by William McKenzie and is still actively producing. Three of the whisky brands the distillery produces are Dailuaine Aged 16 Years, 22 years and the 1980 Cask Strength. The distillery also produces one of the major components for the Johnny Walker blends. The contact details for this distillery are Dailuaine Distillery, Aberlour, Banffshire, AB38 7RE with the telephone number +44 (0)1340 810361.